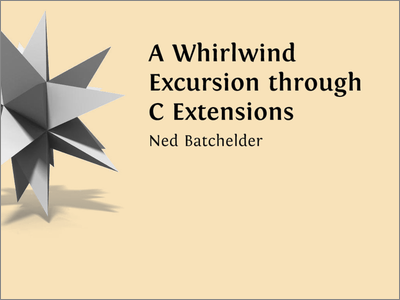 I’ve finished up the slides and written prose for one of my PyCon talks: A Whirlwind Excursion through Python C Extensions. Brilliant, thanks heaps Ned, I never understood any of this before. It's the best talk writeup I've ever seen. Will you share the sources of this presentation? I assume you produce both the slides and the HTML writeup from the same (reStructuredText) file? Thanks guys! Jake, Marius found the info: Fontin is a nice font, and it's free. It also happens to be the font used in the interestingly done subtitles in Slumdog Millionare. About the production process: I used Bruce, heavily augmented by Python code to produce the written page and slides (and thumbnails, etc) from the same XML source. Maybe I'll write it up at some point, but I don't think it's very pretty.